Your Mom loves you. The Empress is the archetypal Mother: creator, nurturer, protector of the Earth and all its beings. Her power comes from the heart. She does this out of her own strength, whole and complete. In other words, unlike Mrs. Stone, she doesn't need Dr. Stone overseeing and approving her activities. Sometimes the archetypes are so big the Hollywood world can't encompass them. 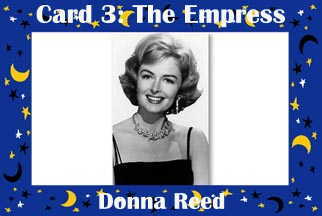 Donna Reed picture respectfully snagged from The Donna Reed Foundation for the Performing Arts, which perpetuates "her deep commitment to youth, education and the performing arts" (natch).